Having been in business over 20 years, R Fulton Improvements has the highly skilled technicians for all your commercial HVAC needs. 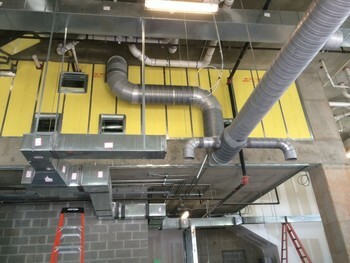 We are certified to perform all types of commercial HVAC work. Evaluate - All buildings need to be analyzed to determine the right HVAC system for your property. Design - Once the property has been assessed, our HVAC team of engineers will come up with a system to optimize the heating and cooling. Build - After the engineering team has completed the design of the HVAC system, our experienced installation team begins installing the system. Service - Although new, and correctly installed, all systems require servicing from time to time. Call R Fulton Improvements and our technician will be there to service your system at YOUR convenience. Whether your needs are HVAC installation, repairs, or simply maintenance, R Fulton Improvements is dedicated to providing the businesses with professional, prompt services. Call R Fulton Improvements at (678) 251-9181 to discuss your businesses heating, air conditioning, and ventilating needs. Ask about our commercial HVAC maintenance contracts.